Here's another photo from the launch party for Every Day Magic - A Pagan Book of Days, which took place at The Atlantis Bookshop, near the British Museum, earlier this month. 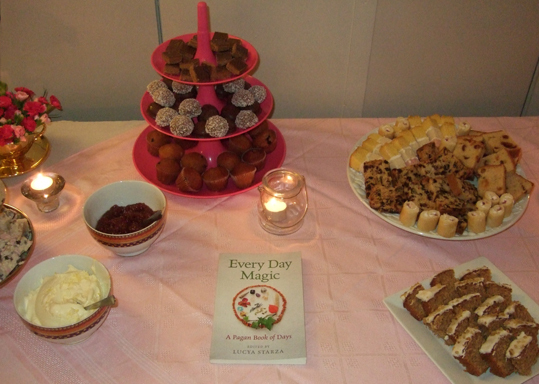 It shows a copy of the book on the wonderful buffet of cakes and scones that were provided by shop owners Geraldine and Bali. The party took place in the temple space under the main shop, which has hosted many historic meetings in London's occult history. It was where Gerald Gardner held his coven when he was in London and was where Margaret Murray introduced him to Cecil Williamson, before the two men worked together to start up the Museum of Witchcraft. I like to think that, in a small way, this book is a part of a continuing tradition of people getting together to produce magical things. Every Day Magic, which is published by Moon Books, contains contributions from nearly 50 pagan authors and practitioners from many different traditions across the world, including Atlantis' Geraldine Beskin, best-selling pagan authors Ellen Evert Hopman, Melusine Draco, Harmonia Saille, Rachel Patterson, Caroline Wise, Elen Sentier and other Moon Books writers. I edited it and also wrote several entries. It contains 366 spells, rituals, meditations, Pagan prayers, divinatory techniques, poems to read and recipes and craft projects to try out, along with the details of festivals that take place throughout the year. On each Pagan Eye post, I show a photo that I find interesting, with a few words about it. It could be a seasonal image, a pagan site, an event, or just a pretty picture. If you want to send me a photo for a Pagan Eye post, please email it to badwitch1234@gmail.com. Let me know what the photo shows and whether you want your name mentioned or not. For copyright reasons, the photo must be one you have taken yourself and you must confirm that you are submitting it for A Bad Witch's Blog.